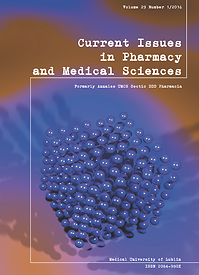 Current Issues in Pharmacy and Medical Sciences formerly Annales Universitatis Mariae Curie-Skłodowska, Sectio DDD (1988-2011), Pharmacia is a quarterly journal being an important source of information from different branches of science, such as: chemistry, pharmacology, biochemistry, toxicology, medicine, etc. with special emphasis on pharmaceutical sciences and research on bioactive substances. The journal globally welcomes all researchers and authors interested in the field of pharmaceutical and medical research. Current Issues in Pharmacy and Medical Sciences provides a platform to authors and readers interested in exchange of important recent research and ideas. The Journal welcomes both fundamental and applied work, as well as improvement initiatives, opinions and debates to encourage new thinking in the related fields. Authors publishing in Current Issues in Pharmacy and Medical Sciences receive 8 points.